I decided to Paint All the Things and not fret too much about how they look in photographs. One art form at a time! You can pretty much see what's going on here, although perhaps not the brownish evil clouds over Thangorodrim that hide the stars. I wanted to give Fëanor armour that would look a bit different to the standard movie-elf armour, because after all, Fëanor's armour is thousands of years earlier than Lord of the Rings, you wouldn't expect him to wear the same armour that they do. So, this is armour (and stance) inspired by a photo from the reinactment group, The New Varangian Guard, in Australia. Only later did it occur to me that if there is one person who could quite reasonably be given ridiculous Fantasy Elf armour, all over spikes and crests and twiddly bits, it is Fëanor. Because Feanor's armour was the first armour ever invented, and he invented it with the intention of impressing and alarming, rather than with an actual war in mind. Depending on whether you think he was expecting to be able to get away with stealing the Teleri ships at Alqualondë, he may not even have worn it in a battle before this one. I love your Balrogs. 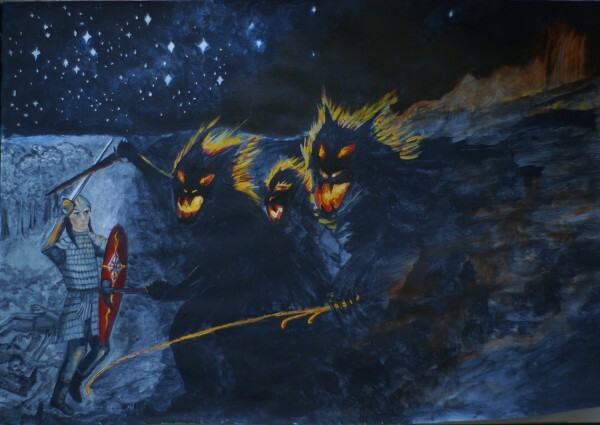 Your Balrogs look quite overjoyed with excitement about going getting to chase squirrels fight Fëanor. I think it makes sense that Fëanor would have fairly simple armour. If it was indeed the First Armour, then everyone would go "Wow!" at it merely for existing. But each successive armour maker would have to do something new and exciting to make his armour wow-worthy, so would start adding twiddles and gimmicks. The Balrogs are bluer in the photo than the painting. They should be more black. And they are a bit catlike. This is deliberate. Why? Because one of those balrogs is.... GOTHMOG. I like your Feanor :-) He looks to me much more like a Tolkien Elf than most representations I see. I gave it an ebony handle to begin with, but Pp felt that it should be all of fire. I'm not sure if the ebony handle would have made things better or worse! ...and thus has king_pellinor solved one of the great debates of Tolkien fandom. Clearly what we are seeing here is "shadow-like weeings". I also love your Balrogs. :-) To me they do a very good job of looking both menacingly animalistic and not completely corporeal. Take as look at this for fantasy armour! This was real, but ceremonial rather than for use. Tokugawa era armour is as you would expect extremely practical and quite plain. The Balrogs look rather as I imagined Tevildo, Lord of Cats, to look. I was thinking of Tevildo too! The first armour is just a fantasy costume (the chap in it is quite close to my view of Fingon - too cheerful to be Feanor and not hard-bitten enough to be Fingolfin). The second one is a tarted-up version of the real thing. I once saw several sets of armour belonging to Date Masamune, a notable regional warlord of the Tokugawa Era. He was not a tall man by modern Japanese standards (around 120cm, perhaps, or even less), but must have been extremely strong. His armour was totally functional, compared to the parade armour that his descendants wore in the Meiji Era, which was very like the one in the photo in decorative excess. His swords were very plain too, and had clearly seen hard use (he become head of his clan at 18 and died in bed at 70,which pretty much says everything).